Note: This is a beautiful prayer that has been written to be used to bless apples to be distributed to the faithful on the feast of St. Irene Chrysovalantou. This is performed in pilgrimages of the Saint (e.g. 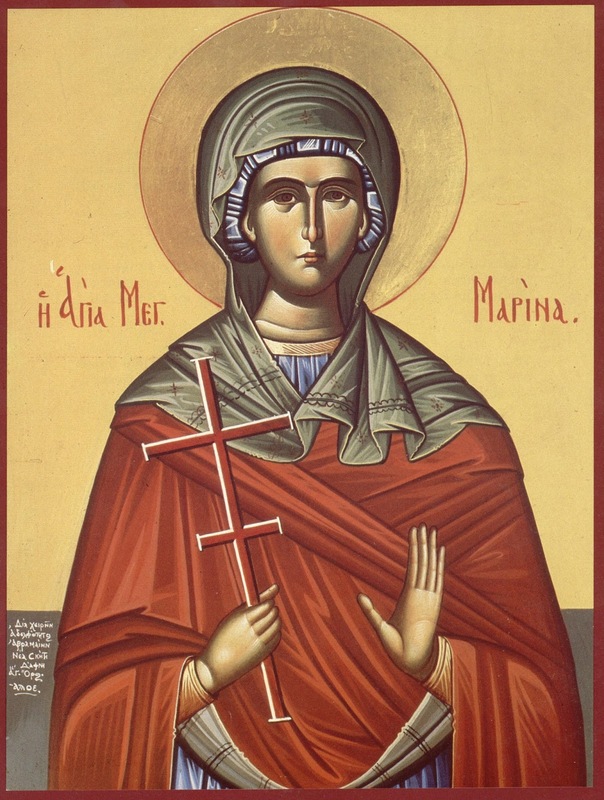 in Astoria, New York (Ecumenical Patriarchate)), and many who have come with fear of God and faith and love have received wondrous healing through the intercessions of St. Irene, especially couples who have a difficult time bearing children. Also, there are many other parishes and monasteries where the priests bless apples for the healing and blessing of the people, and in memory of a wondrous Saint, who tasted of the fruit of Paradise in her earthly life, and now and ever intercedes for us to the Lord before His Throne. Amateur translation below: please review before any public or liturgical use. O Creator of everything and of all creation, O all-wise Creator and Governor and Foreseer, the Provider of every earthly and heavenly good, and the Distributer of gifts, O only immortal King, You Who feeds our bodies with the fruits of the earth, and strengthens our souls by Your mystical and invisible presence, You Who grants to Your sons and friends the good things of Your eternal Kingdom, and Who reveals the inscrutable Mysteries of Your will to Your Saints from all ages, and the richness of Your Love supplies all through the inheritance of eternal gifts, You Who the Venerable Irene pleased in the Monastery of Chrysovalantou through perfect asceticism, granting her the knowledge of heavenly Mysteries and the promise of Your Kingdom to come, Who granted her three apples from Paradise, through Your bosom-friend and theologian John, as a foretaste of joy that surpasses this world, which filled her with unspeakable fragrance and rejoicing, as a witness to the Divine Trinity Which had dwelt in her, Who taught her Your perfect desires and showed her life to be a fragrance of praise and a holy offering, do You therefore now, O Merciful Lord Who loves mankind, the spring of blessings and grace, Who sanctifies those who believe in You, and ever heals those who hasten to You, receiving everything that we offer to You with goodness, receive also these apples, and bless them through the riches of Your goodness, and grant to those who partake of them the holiness of Your blessing. May these be for healing of soul and body, for this authority belongs to You. Dissolve the bonds of barrenness for all those who partake of these apples, and richly grant them children as the grains of sand. Heal the wounds of the soul, and the pains of the flesh for those who seek Your help, through the reception of these apples. For we count your intercessions for protection, [O Saint]. Send down the peace from above on all those who honor you, as the namesake of peace, and the faithful healer of God, the Prince of Peace. Grant to us to pass through life without reproach, that we be made worthy to partake of the food of Paradise, while we partake of the fruit of grace mystically, and are filled with sanctification and partake of salvation. Confirm in us the fragrance of grace, which we lost through tasting of the apples in Eden. Renew within us, through your intercessions, the Holy Spirit, to strengthen us in all things. Strengthen us in the good fight, and with Your radiant [Guardian] Angel may we complete the road of the faith. That we might, together with the Angels of God, give glory, and offer Him worship, worshipping the unbegotten Father, giving glory together with the begotten Son, and honoring the All-holy Spirit: One Trinity and Godhead, to Whom belong glory and worship unto the ages. Amen. Note: The following is my amateur translation of the first canon (in the first tone) in a series of eight canons in the eight tones written by St. Joseph the hymnographer to honor the great martyr and healer of Christ, St. Panteleimon. These are very beautiful and compunctionate hymns, and rightly praise such a great wonderworker of Orthodoxy. For the full texts of the canons in Greek, see here. If I am not mistaken, these are used around the feast of the Saint (i.e. either in the days leading up to or following his feast) in the his Monastery on Mount Athos to more fully celebrate this great feast, the feast of the Russian Monastery of the Holy Mountain. May St. Panteleimon intercede for us all, and grant us healing of the passions of our souls and bodies! Amen! The acrostic reads: A hymn of Joseph. Ever standing with boldness before the throne of grace, O blessed Champion, send down upon us forgiveness of sins, and intercede with Christ. You endured tortures, O Panteleimon, being aflame with divine eros for the Master. Entreat Him that He deliver us from every danger. Coming to know the Creator, you called upon Him, and thereby raised a dead man, O chosen-one of God, therefore I cry out to you, bring to life my deadened soul through your prayers. You bore the Master and King of all creation, O All-holy Lady, ever entreat that we be granted the Kingdom of God. With strength, O Martyr of our God, you were steadfast through the scrapings of your flesh, and the blazing fire, for His love, and you endured the terrible burning by flames. Having been bruised by beatings, and greatly broken, the Redeemer appeared to you to strengthen you, O glorious one. Entreat Him that He enlighten our minds. Being a lamp full of the light of the divine radiance of healings, you shine for those who are in the night of sicknesses, and you cast out the mist of the demons, O Saint worthy to be praised. After giving birth, you remained incorrupted as you were before birthgiving, O All-hymned One, entreat the Creator for all, that we delivered in body and nous through your motherly intercessions. Having been illumined in mind, you have passed through fire, and have found rest through the refreshment of grace, O Panteleimon, and therefore you ever pour forth the streams of wonders, and you cease the fire of illnesses through the power of the Spirit. You endured the raking of your flesh, O wise one, and having been boiled, you remained safe and unharmed through godly refreshment, O blessed one. Therefore, we cry out to you, deliver us from every danger through your prayers, O all-praised one. The terrible foe was unable to storm the tower of your divine soul, O Panteleimon, but as if another were suffering, you were steadfast amidst the waves, being founded upon the grace of God. You were shown to be a palace and a throne of God, and a Dwelling-place, and a noetic Gate, through which we have beheld the only Logos pass through ineffably, O Birthgiver of God, saving manking through You. Your body was placed within the earth, O Saint, and thereby sanctified it. But entreat the Surpassing Good One, that we who bless you in your holy temple might be sanctified. The heavenly army clapped its hands at your martyrdom, together with which we entreat that we be granted, O Panteleimon, grace and mercy and correction in life. Enlighten my lamp that has been quenched, through your prayers and intercessions, O Panteleimon blessed by God, that I might ever bless you as my protector. We praise You with divine hymnology, O Spotless Lady, and we entreat that You ever protect and deliver from every danger and darkness, through Your intercessions. You gave the light of spiritual light as did Christ to the man born blind, O all-praised one, the boast of Martyrs. Let us offer to God a hymn of thanksgiving, for you deliver from the depths, and angelically save through your visitation, O all-praised one, that I might honor you. 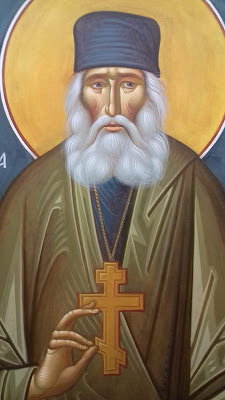 Deliver us, O all-praised Panteleimon, from the soul-corrupting passions, from evils of men, from the waves of thoughts and from the fire of Gehenna. As one truly fair and beautiful among women, you conceived the Beautiful One in your womb for all mortals, and you gave birth, O Pure One, in a manner surpassing words. Rejoicing in soul, O glorious one, you bore trials and the terrible wheels, from which God paradoxically saved you, as a confirmation to the faithful who beheld your good and manly feats. 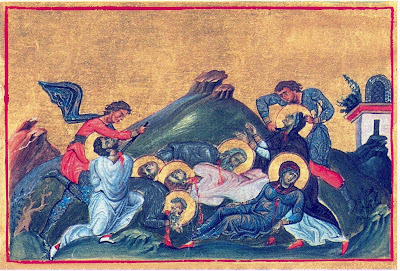 On behalf of Christ, you were cast unto the beasts, but remained unharmed, O Panteleimon, but earnestly entreat on behalf of us, O Martyr, that we be delivered from the evil foes that tempt us. You became a keeper of the commandments of Christ, O Martyr, speaking to those in prisons, and dangers and all forms of pain. Therefore you were granted the grace to heal the passions of our souls and bodies. 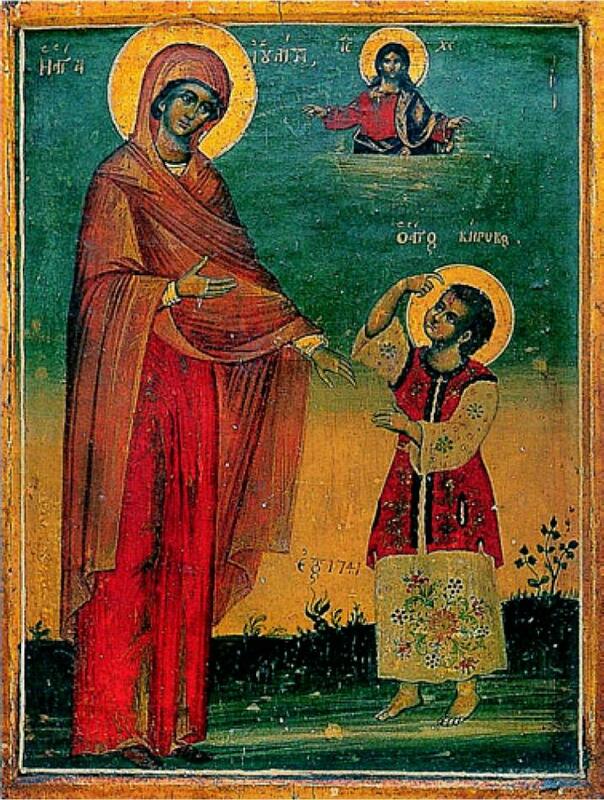 You who transported us from earth to heaven, and appeared as a mystical ladder, You are the pure and blessed Theotokos. Therefore, we hymn Your great deeds, O Pure One, unto the ages. You dawned like the sun at dawn, O wise one, enlightening the ends of the earth with mystical rays, and truly dissolving the darkness of idol-mania, O blessed Panteleimon. Having been bound, you dissolved the error of the enemy by your grace. Therefore I entreat you to dissolve, through your prayers, my many evils, through your intercessions, O wise Panteleimon. 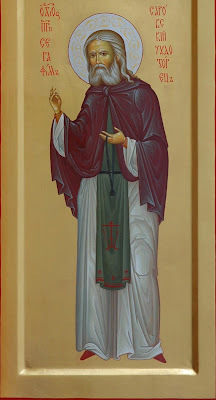 You were taken up as in a chariot, by your sacred blood, to stand beside Christ, rejoicing, and received the crown of incorruption, O Panteleimon, the comeliness of Martyrs. Heal our brokenness, for you truly gave birth to the Physician of all, O All-pure One. Therefore we bless you together, with rejoicing of soul, O Birthgiver of God. 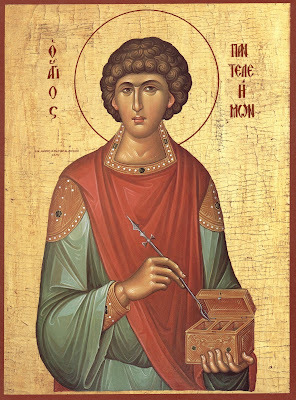 Your appearance was made handsome by your holy martyrdom, O Martyr Panteleimon, and you stand beside the King of the Heavens full of beauty, and you partake of divine light, and ceaselessly intercede on behalf of us. 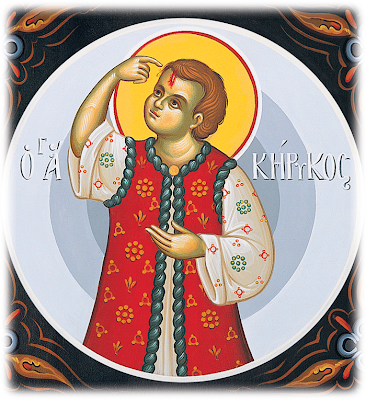 You, O steadfast of heart, traveled the paths of martyrdom unflinchingly, O Champion Panteleimon, and were beheaded on an olive tree, and was reborn, O all-joyous one, as a compassionate and merciful healer of every sickness, in Christ. You blossomed as a fragrant rose in the field through your struggles, and gave the fragrance to the earth of the fragrance of your wonders. Therefore we cry out to you, O wise one, deliver us from our passions, through your intercessions, taking away every stench and terrible thing. Being in a frenzy of sins, and endless wrath, I am hearding towards worse things, but lift me up, O greatly-merciful God, through the intercessions of Your Spotless Mother, that I might partake of eternal life. For Canon II (in the Second Tone), see here. May you go to Paradise well. -Could it mean, Elder, "May you go to the good Paradise?" Listen to what you are saying; is there a bad Paradise? In any case, in order for anyone to go to sweet Paradise, be must eat much bitterness here, in order to have the passport of trials in his hand. What things are happening in hospitals! What tragedies! What pain the world has! How many mothers--O poor people--are getting surgeries, thinking of their little children and having the agony of the whole family! How many heads of families have cancer, and are getting radiation, and what a torture they have! They can't work, but they still have to pay rents, and have a whole bunch of expenses! Here, others have their health and they still can't make ends meet. How much harder is it for someone who is sick or is too sluggish to work to fulfill his obligations! They have given me all people's problems. How much I hear every day! Continuously tortures, difficulties!...Bitterness all day from the mouth, and at night I fall down fasting before I fall asleep. I sense great bodily fatigue, but inner rest. ***Note: The greeting, "Good Paradise", is a traditional greeting among many Orthodox monks and laymen for namedays and other special occations. It replaces the common Greek phrase "Chronia Polla" ("Many years"), and thus more properly focuses not on more years on earth, but on reaching blessed Paradise. Nun Agne told us: "In 2007, a fifteen year-old boy came to the Monastery, who was one step away from the end. He was from Cyprus, and suffered from his first steps in life from cancer. His father had died, and his mother tried to remain strong for him, and for his smaller brother, Vasile. The child had had 23 surgeries, but nothing had happened. His condition got worse, and thus the doctors at the great hospital of Athens told his mother that he needed another surgery. They didn't know if he would be able to survive the surgery, as he was already paralyzed. His mother, one day before traveling to Athens, saw the Panagia in her sleep, who told her: "Don't worry. 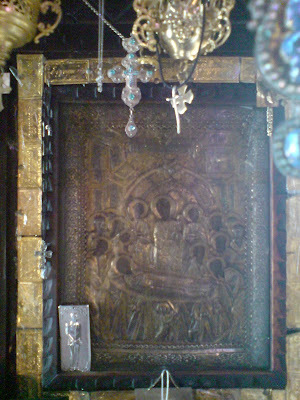 I am Panagia Malevi. Come to my home, and Andreas will be well." The woman, as soon as she awoke, asked her mother who was Panagia Malevi, and she also did not know. The women asked around, and learned that the Monastery was in the area of Greece called Kyrouria. 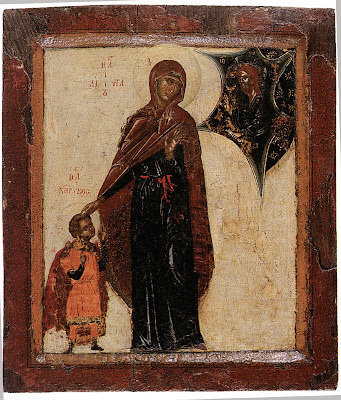 Thus, the woman took her child to the airport, and rented a taxi, and came here to the Monastery." According to the nun, the inhabitants of the village and the nuns and the taxi driver helped the mother put the child in the wheelchair, and bring him into the church to venerate the icon. And as soon as he embraced it, Panagia filled him with strength. The child, as he said, felt within him something strange penetrate his body, and he straightaway cried out: "let me walk". His mother and all of those around him froze. Everyone began to cry, and Andreas stood up, walked and began to run. 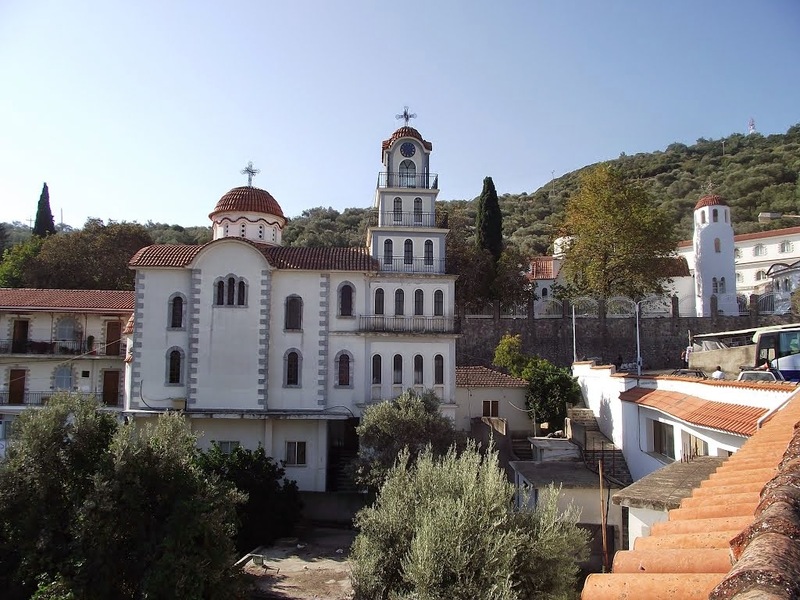 Nun Agne mentioned: "I have been in the Monastery for forty years, and I confess that at that instant, I felt the presence of Panagia so clearly...I shudderd. Andreas left standing, and left his wheelchair here, because as he told us, he didn't need another." The doctors who tested the boy after his visit to Panagia Malevi could not believe how this child was walking, and they could see how he was still alive. The tests furthermore still showed cancer in the largest part of his body, but the child is well. 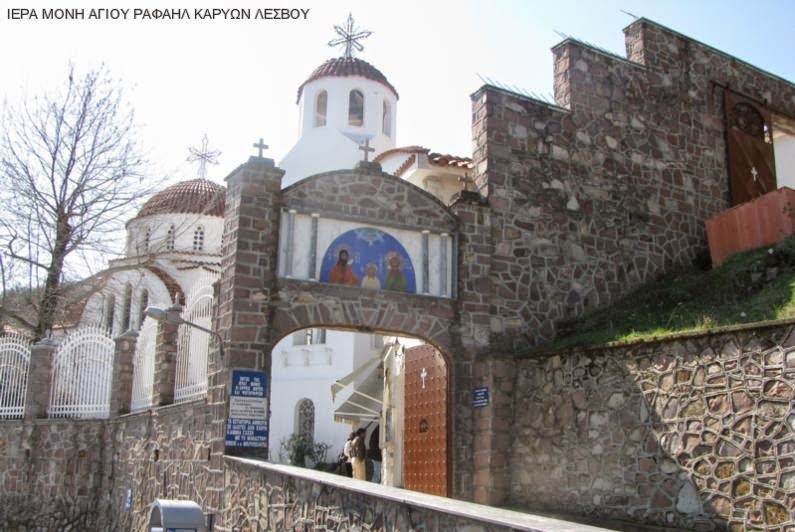 From then Andreas and his mother visit the Monastery once a year to thank Panagia. "O Beginningless, Immortal, Timeless, Incomprehensible and Unimaginable Lord, the God of all and Creator of all creation, the Foreseer and Savior of all, as I have hoped in You, I thank You, that You have brought me to this hour, as I approach the crown of Your righteousness. I hymn and bless Your uncountable compassion and philanthropy, as You desired to number me with Your chosen servants. Look down, now, upon me the lowly one, O God and Master, Lord of mercy, Ruler of all and All-powerful One, hearken to my prayer, and fulfill my entreaties in praise. To the honor and glory of Your all-holy and worshipped name, grant remission of sins for all those who desire to build a church in the name of Your servant, or who serve in them with prayer, or who write of the struggle of my martyrdom, and to those who read it with faith, remembering the name of Your servant, and make them to bear fruit through Your power. I ask that for those who embrace this dwelling-place of my body, where I suffered martyrdom for Your love, grant forgiveness of sins according to the measure of their faith, and do not let any hand of damnation approach them, nor hunger, nor plague, nor any other danger of soul or body. And all those who desire to celebrate, glorifying with faith and seeking Your salvation and mercy through me, grant to them Your good things in this world, and to go forth pleasing You, and make them worthy of Your heavenly Kingdom, for You are the only Good One and Lover-of-man, and the Giver of Good things, unto the ages. Amen. In August 1963, 75 people from Livanata came to visit the Monastery. They worked on the cistern of the Monastery, the spring of Holy Water, fervently. Many from Livanata, the homeland of St. David of Evia, had vowed to offer something to the Monastery of their compatriot, either money or work. Thus, these 75 men came to work on the cistern. And in the Monastery there were another 15 people helping them. Fr. Iakovos was coordinating the work, but he was the only one who could prepare the food during the stay of these good people. He realized that soon there would be nothing in the pantry. After one day the food was finished, and he did not have any money. He looked in all of the cupboards, all of the corners. He was able to only find 2.5 okas [about 3.25 kilograms] of orzo. And he found half a loaf of bread. Elder Euthemios also have him half a loaf. This would have been a comical amount for the roughly one hundred people who were doing manual labor the whole day. "My Saint, these people are working in your Monastery. They will return tired and hungry. I have nothing else to give them to eat, other than these 2.5 okas of orzo with a little oil, and these two half-loaves of bread (as he showed them to the Saint). I entreat you, bless them, that all of them might eat and be filled." He cooked in that pan, and they served all the food from it, and it was not emptied. All of the people were filled from that half of a pan, and there were leftovers! Many witnessed this, including the current abbot Fr. Kyrillos. Many years later, speaking of the miracles of St. David, Fr. Iakovos said: "My brother, once again there was the miracle of the feeding of the five-thousand!" Come, and let us all behold a strange and paradoxical sight. Who has ever seen a three-year-old child putting to shame a tyrant? O the wonder! A mother is nursing, and the reclining infant cries to the milk-giver: Do not be afraid, O my mother, of the threats of the terrible leader of this world, for Christ is the hope of those who believe in Him. The three-year-old preached the Trinity, and the nursling confirmed the mother: Cease, O my mother, the wailing of tears, for the Creator beholds us above, and saves our souls. 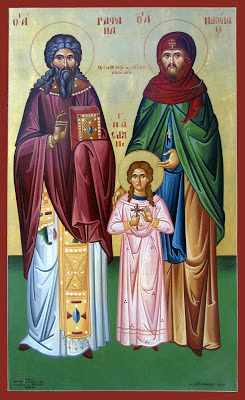 Your rational lamb Julitta, O Christ, together with her three-year-old lamb Kerykos, stood before the judgment seat, and boldly preached their Christian calling, not at all fearing the threats of the tyrants, and now they are crowned in the heavens, rejoicing as they stand beside Christ. Julitta bears Kerykos, the Martyr of Christ, in her arms, and in the stadium, she cried out with motherly rejoicing: O Christ, You are the strength of the Martyrs. Enlighten my nous, O Christ, with the light of Your commandments, that I might worthily be strengthened to hymn Your Saints, and to tell of their struggles. What tongue could be able to speak of the struggles which they endured, and of their prize of the contest? Therefore I entreat You, O Lover-of-man, grant forgiveness to my wretched soul, granting me time for repentance. For this reason You willingly took on flesh, that You might lead all towards life, which the Champions were made worthy of, as they ceaselessly chant: O Christ, You are the strength of the Martyrs. St. John Chrysostom: "The Church is a hospital, and not a courtroom, for souls"
The Church is a hospital, and not a courtroom, for souls. She does not condemn on behalf of sins, but grants remission of sins. Nothing is so joyous in our life as the thanksgiving that we experience in the Church. In the Church, the joyful sustain their joy. In the Church, those worried acquire merriment, and those saddened, joy. In the Church, the troubled find relief, and the heavy-laiden, rest. What could be more desirable than to meet this voice? What is sweeter than this invitation? The Lord is calling you to the Church for a rich banquet. He transfers you from struggles to rest, and from tortures to relief. He relieves you from the burden of your sins. He heals worries with thanksgiving, and sadness with joy. No one is truly free or joyful besides he who lives for Christ. Such a person overcomes all evil and does not fear anything! 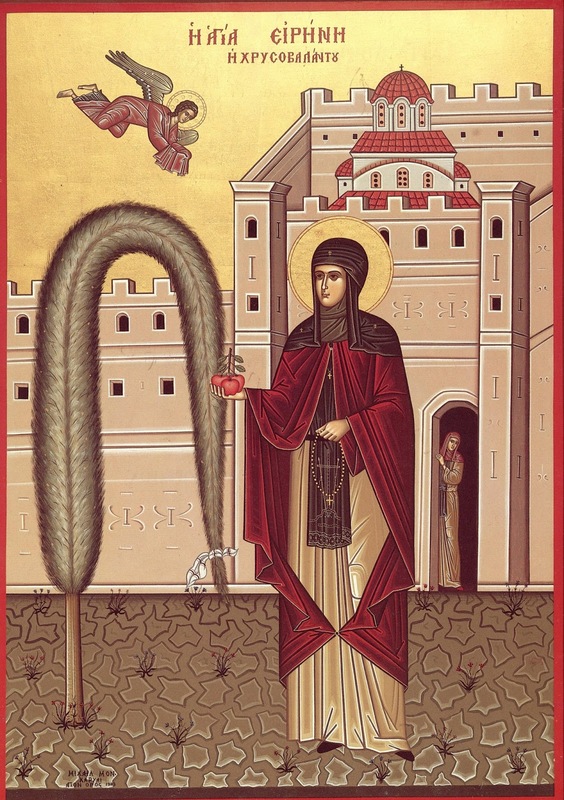 I thank our good brother John Sanidopoulos for posting a beautiful text by our Holy Mother Evgenia, the Abbess of the Monastery of St. Raphael, as she recently reposed in the Lord. 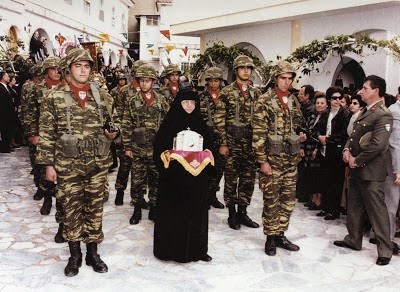 May she have a blessed repose with her great defender, St. Raphael, in the Kingdom of Christ. The first period, 750 years ago (in 1235), it was a Monastery for Women with the Holy Olympia as Abbess. The second period, about 500 years ago (in 1463), it was a Monastery for Men with St. Raphael as Abbot. And today is the third period we are living in this holy place of Karyes. Many pilgrims entreated me to write about my coming to this holy place and also the life we live at Karyes, and the historic background of the Holy Monastery. I will not refuse to satisfy all, although I would prefer to describe only what happened to others and avoid what happened to myself. But the love for my fellow man, is surpassing everything else. And how can one be silent, when he has put his hand onto the print of the nails, and has touched the true existence of the newly-appeared Saint Martyrs? How could he not wish to also strengthen the faith of others? Would he not have to give a defense if he remained silent, when even the stones will confess and cry out? And to what purpose, I am thinking to myself, were all these revelations, all these supernatural events and facts? To keep them for myself? A Saint used to say, if it is to be that my brothers and sisters are going to be lost, I won't wish to be saved either. I am praying with all the fervor of my soul, for the Grace of God to touch my heart and the power of His love to act on others. Oh then, love becomes boundless, wide. One loves the universe, burning with the hope for the salvation and deliverance of others who are his brothers and sisters. Love annihilates obstructions. I am thinking of the superb hymnographer of love the Apostle Paul, who was willing to lose His soul as long as others could be saved, even those who persecuted Him. His inconceivable grandeur, how it moves me: His luminous figure, His gleaming example is lighting our road. I know it is daring for one to write about the miracles and revelations of Karyes. I know that one should think carefully before mentioning even one of his visions. But since those who saw the Saints are innumerable and since Saint Raphael shone like a sun in our lives and with His splendor enables human beings to derive deep knowledge and to feel in this blood-stained place the atmosphere saturated with divine grace, when they arrive from all corners of our tragic earth, distressed and sad, and agony is sketched on their faces and they are deeply moved, and they are departing with an ultra-mundane joy and holy emotion when the love of the newly-appeared Martyrs is magnetizing the faithful, and when the same thoughts and feelings are shared by all, and although they come here with a deadly melancholia and the uncreated spiritual Light makes them feel a strong attraction and an ineffable fragrance, and with enthusiasm they exclaim "here is a second Mt. Tabor", "it is the baptismal font of Siloam", "we were baptized again", and you see an unfeigned joy shining on their faces which dispels all melancholia, how then can one be locked up in himself and not confess at least a few of the divine gifts, which God's condescension allows? When one lives under such circumstances and he sees the Light of the divine world shining and the supernatural events are inundating his heart with emotion which shocks him, and he remains ecstatic before the depth of God's great love, how can he not cry out "come and see"? I feel deep contrition and humility before such mysteries and I feel my being annihilated. How much splendor comes out from the gigantic spiritual stature of Saint Raphael and His Holy Companions! Here one finds himself in the area of divine beauty, as if he were living in the harmony of the infinite and he is burning with divine yearning. I will refer to at least only a few of the innumerable events which I lived through at this blessed, holy and bloodstained place, for the glory of the Saints. Oh, how many appearances, how many visions, how much protection I found which the pen is weak to describe. But no matter how much one can say, no matter how much one can write, he will not be able to touch the reality. Great is the multitude of the miracles, how can one remain silent, when everything around him confesses the miraculous power of the Saints and prove their true existence? At this moment my mind turns back when for the first time I came all alone to this place. It was by Divine Providence that I found myself here. Saint Raphael was inviting me by saying to me that I must surrender my plans to build the Church of Saint Magdalene, which I so much wished, and I had gone to Vrilesia of Athens in order to build it, with the permission of his Eminence Panteleimon Fostine. From Chios, where I was Abbess at the Holy New Monastery and at the Monastery of Holy Protection, I went for a while to Athens for this purpose. Deep emotion prevails throughout my whole inner being and I feel great contrition when I think of the appearances of Saint Raphael. "You will not build the Church, I am foreordaining you Abbess for my Monastery". Oh my God, these words by the Saint brought an earthquake to my psychic world. The invincible Divine power had overturned all things it engendered, other longings, other ideas, other enthusiasms. Then the letters were arriving from different persons and they were confirming the invitation of the Saint, emphasizing that this is His will for me to come as Abbess to the place of Karyes, and that a Monastery would be built. And after a most overwhelming vision which I had at dawn, on that same day I found myself at this place. Saint Raphael appeared fully alive and He said to me: "Come, I am calling you". I realized from the stern appearance which he had that I must hasten my coming and I abandoned everything and I started off on that same day. Likewise, Kostas Kanellos, a faithful person from Therini travelled to Athens for this purpose, and without knowing me he came to tell me that "we are all seeing the Saint and he is telling us that you must come as Abbess to Karyes, and the Saint himself ordered me to come and to tell you that you must hasten your coming". He himself relates that as soon as he got out of the ship and he did not know neither the streets nor which direction to take, someone approached him and asked him: "Where are you going?" He replied: "To Vrilesia, but I do not know how to get there". "Come, I will take you", and he dropped him off outside the house. The confirmation of the Saint's will was with a letter which I received from His Eminence the Metropolitan of Mytiline, Mr. lakovos, as well as from the then Chancellor "who was President" Nikodemos Anagnostou, the now Metropolitan of Ierissos, who also showed great interest for the future Monastery and they were writing that "according to Saint Raphael's order, I must come as Abbess because it was predestined to become a Monastery for Women." And after that overwhelming vision in which I saw the Saint calling me, I started off on the same day. As soon as I reached Mytiline on my way to the Metropolis, I was stopped by Mrs. Stella Karali, a resident of Mytiline who was unknown to me till then, and she told me the following: "Would you perchance be Abbess Evgenia, who is about to come to the Monastery of Karyes?" "Yes, I am destined to go there." "All night my husband was saying in his sleep: 'Is it Evgenia, my Saint? Evgenia?' I woke him up forcefully and I asked him: 'Which Evgenia are you talking about? You did not let me sleep?' 'Do you, Stella, know of any lady by the name of Evgenia, in the Angelic Order? Saint Raphael will bring her as Abbess to the Monastery of Karyes.' 'I do not know her either.'" I continued my way to the Metropolis to obtain the blessing of His Eminence and he gave me my official appointment. I told our Metropolitan that I had with me a hundred gold pounds which my father had given me in the past and that I would use them for the initial needs of the Monastery. Those unrepeated moments which will accompany me to my last breath, were the first three days that I stayed nailed down near the Holy Relics, deeply moved and ecstatic for the so great condescension of the Saints towards me. The first day I saw all three Saints, Saint Raphael who blessed me from a distance of a meter, Saint Nicholas who was standing near Him, and above the earthen pot was Saint Irene. When you see figures of Saints who left from this life so many centuries ago, and you discern even the minute details, your thought stops before the divine greatness which created all things with such wisdom. Saint Raphael has a tall stature; he is middle-aged, with grey hair, medium beard, a little pointed. His eyes are grey-blue, sparkling and very expressive. He has so much grandeur, his appearance is imposing and in general His Divine countenance overflows with heavenly grace and an inexpressible ultra-mundane beauty. In His appearances he presents himself sometimes in his Celebrant's dress, with gold vestments, sometimes in black clerical frocks and his priestly high hat or without a head cover. Saint Nicholas is a little shorter, younger, with soft wrinkles, slender, chestnut blonde, with a small beard, a very gentle countenance. He appears in a Deacon's vestment or in a Monk's frock. 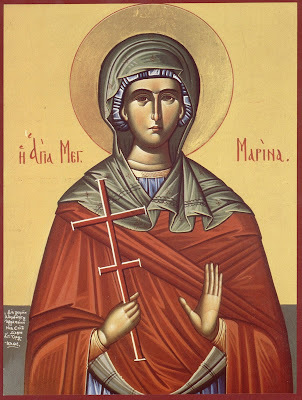 Saint Irene is a girl of twelve years of age. She appears in a white or yellow dress, long to her feet, with a belt around her waist, and with blonde hair divided into two pigtails. How many appearances, how many miracles have followed! I remain astounded before their lively appearance. I am reflecting how many times they helped me in this toilsome task and at every adversity! I am considering how many things were achieved, how much healing, how many appearances in the duration of thirty-six years! What a holy place it is here, and how great the entities of these Saints are! Our dark era needed so much the resplendent Light of Saint Raphael to shine from one end to the other! How much consolation is offered to the fatigued people of our times! Oh, how much my heart is burning with an all warm and ceaseless desire that all distressed people find the healing of their soul and body, the psychic calm from the storm of the world! When I consider that this place was as the mountain opposite when I came, I marvel at the miraculous power of Saint Raphael, who I, presiding here, and thus all things can be done. When I first came, there was not even one cell for me to stay in. And I was offered hospitality for the nights at Thermi, and during the day I had set up a tent until the time the cells were built. 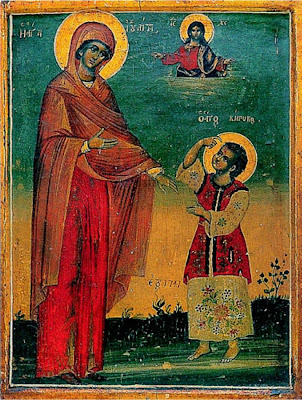 The ardent divine desire of my mother-in-flesh, brought her in a little while close to me, and with her my attendant, Parthenia, who followed me from Chios, when she was still living a worldly life. Mrs. Maria Kounelli, resident of Thermi, had a vision. Saint Raphael, Saint Nicholas and Saint Irene visited her and they told her: "Go up to Karyes and tell Abbess Evgenia that she must stay the nights at your home together with her mother and Parthenia, until the cells are built." And thus, during the initial period, we were staying the nights there. I will not forget the first days that I came, without there being a wall built around the Monastery, nor any iron gates, and without being asleep, I would see that Saint Raphael was accompanying me from the lower Church towards the front gate. He closed from the inside the big iron gate, which in reality did not exist, he locked it and he handed me the key. But it was big and I made the thought why should it be so big, since they now put on the biggest door safety locks and the keys are small. When the time came for the wall to be built around the Monastery and the big iron gate to be made, the blacksmith handed to me exactly the same key which Saint Raphael had given me. I was falling from one astonishment to another, and every so often the Saints were reaffirming to me their lively existence. In a year's time we entered into the first cell. Since then, 36 years have passed and I have today 45 Nuns; and is it not miraculous that which is being accomplished with the brotherhood? We have gathered here from different places (Germany, Australia, Athens, Thessaloniki, Drama, Serres, Larisa, Beroia, Cyprus, Cyclades, Crete, Chios, from different parts of Lesvos, etc.) each one with a different upbringing, different ages, different customs, and we became one family, one sisterhood, and we are passing our days in harmony, and we have become one heart; we are united with an indissoluble bond of divine love. What else is contributing to all these other than the protection of the Blessed Grace of Saint Raphael and His Companions? The Monastery is continuously being built to its entirety. The main Church has been built where the Tomb of Saint Raphael is situated in his honor. As an Abbot, he was buried close to the Holy Altar of the old Church. It is exactly, above the Church where the other tombs of Saint Nicholas, Saint Irene, her father, the Community Chief Vasilios, and the teacher Theodore are situated. The Monastery has absolutely no wealth, except for the contributions of the faithful Christians, and the surrounding land which my father-in-flesh bought and helped me to develop. Is it a small miracle that my father, Philip, in order to persuade me not to follow the Monastic life was making promises of material riches - as long as I did not deny the secular way of life - and sometimes he was saying that I would be disinherited from the estate. And when I would answer him that I preferred the Nun's habit and the humility of seeking alms, he would weep. But finally he did not disinherit me, and apart from the five purchases of the surrounding properties at his own expense, he also helped me financially to build a Church adjacent to the cells for the Divine Services, during the wild winter nights. Likewise, at the top of the mountain a small Church dedicated to the Prophet Elias, a water reservoir and three big cells, and all these were built after a vision. Why the Saint showed me this location, I do not know, and the purpose for which they are destined only the Saint knows. I had also seen a white Cross at the spot which I had to purchase the property, and ever since then, this is our very special piece of land which we call White Cross. For the present time, it is our soul's rest, the place where we take refuge for our meditation and prayer after the inundation of people, who arrive by the thousands to Saint Raphael's port, from the storm of the world. And for the water problem which we were facing at the Monastery, my father helped me and I had built a large 350 cubic reservoir so that the green around the Holy Monastery may be maintained. My father would be deeply moved when I used to tell him of the revelations which I had from Saint Raphael. He was in tears and his joy was unimaginable as he would observe the progress of the Monastery's work. My devotion for the Saints made him devote himself also, and with enthusiasm he would offer whatever I asked from him. He gave me money and I had built a Catacomb, after a miracle by the Panagia. She told me how I should dig, showing me the old Church. Indeed with the excavations, there were found various ecclesiastical objects and the key of the Church. 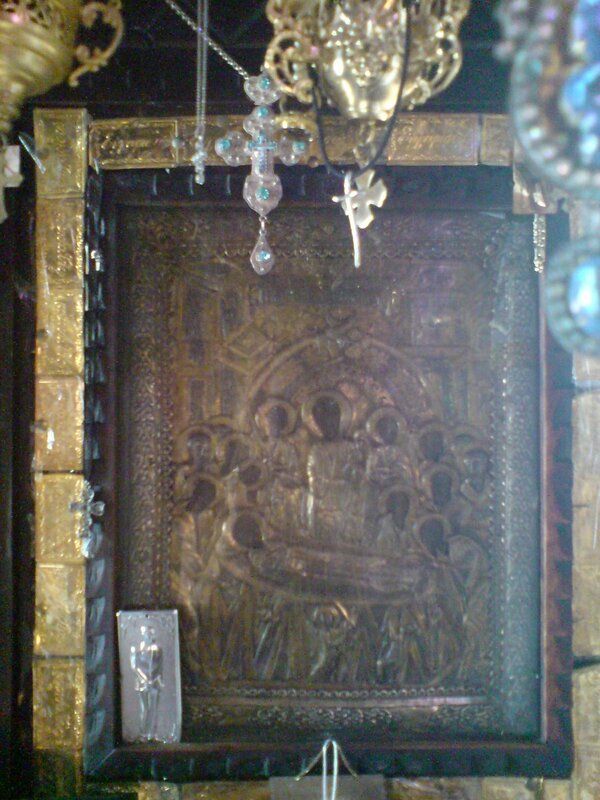 The Catacomb is honored by the name of Panagia of the Holy Protection. One feels deeply moved when entering there and he finds himself beyond time and beyond the world; he feels to "be present in the presence of God". In there we accustom ourselves to the practice and application of the heart's prayer: "Lord Jesus Christ, have mercy upon me". Some time later I had built a small Church for Saint Magdalene in the garden in order to fulfill the wish I had before coming here. Everything all around here talks to you of God. It is a paradise, an exceptionally separate corner. The garden with the flowers, the birds, the deer, the peacocks, that remind you of Paradise. This enchanting oasis brings to a person a psychic lifting up, and he feels as though he is ascending high-up to other spheres and his longing in search for the divine becomes ceaseless. In the garden the beautiful roses, the violets, the jasmines, the lilacs, the carnations, all are in fragrance and they are harmonized with the divine beauties. How quickly all was done! As if a Divine hand placed them. Who gave me this strength? Who else other than the mighty Saint? In the writing of one hundred (100) books for which many times dawn finds me with a pen in my hand, where did I get the fortitude from? Is it not by the blessing of Saint Raphael that thirteen million (13.000.000) copies have been scattered in all nations, a fact which writers and journalists regard as a phenomenon? At your departure Lord, the Disciples turned to work again on ships and nets and catching nowhere. But you, our Savior, appeared as the Master of all and to the right you order them to cast the nets, and the word immediately became act, and a great multitude of fishes was caught and a foreign supper ready upon the earth, of which your Disciples participated then, and now enable us spiritually to delight in it, Philanthropist Lord. So then, You Lord, when Your blessing is absent, we are in drought. The Apostles had ships and nets and 'catching nowhere'. But when you appeared with one word of Your's 'a great multitude of fishes was caught'." Could I ever imagine that my books would assist so much for the accomplishment of building the Monastery, and for the hagiography of the Holy Church? Oh my God, help us so that we always feel amongst us the living presence of our Saints; how much comfort you have given us in the harshness of today's life lacking in grace, to live under the protection of the all-alive Saints Raphael, Nicholas and Irene! Even for water, which we did not have, the living Saint Raphael indicated the place to me. The atmosphere around is full of freshness and the mortal human being feels this freshness within him at this Holy and bloodstained place. With His wonderful Holy life, He did not only achieve, His own sanctification, but He is helping all of humanity. With His voice of love, he brings the message of liberation and of everlasting dew to the souls which are burning today in the scorched side of life. His mercy scatters everywhere the divine nectar and it leads thousands of souls to the starting point, which makes them take the pathway and ascend up to Karyes and find their deliverance. Saint Raphael's offering to the fatigued humanity is unimaginably great. He liberates humans from the dreadful agony, he takes away dangerous ways of living, gives strength, he supports paralyzed knees, he lights up an inextinguishable divine flame, and faith is blooming in the hearts, it grows enormously and inspires divine visions. The luminous figure of the miraculous Saint Raphael has shone in the whole world. He is leading a multitude of people to an ascending course, he brings the awakening trumpet call and lights up divine zeal. He protects from the reefs and shoals, from shipwrecks, and with His divine intervention, he brings spiritual regeneration to all nations. The extraordinary signs at the place of Karyes, these awesome miracles are granting strength to the faithful, inspire enthusiasm and dispel the darkness. They fill hearts with hope, with divine happiness, and with fortitude and patience they continue their difficult road here on earth. The God-sent Saint is magnetizing every person who approaches Him with faith, and the faithful find inconceivable beauty in His unattainable grandeur. The miraculous and great hero of love, with his powerful radiance, has conquered the hearts of all; his living presence is so close to human pain. It has made the holy place of Karyes, a spiritual lighthouse, a spring of divine grace, and it has become a magnetic anchorage, where the tired wayfarers of life obtain strength, courage, and their faith is made firm. They find healing, their rebirth and their deliverance. His divine splendor opens new horizons, opens eternal doors, generates convictions, and with the brilliance and supremacy of his ineffable mercy he guides mortals to eternity, and he spreads everywhere smiles from his radiant countenance. It was in God's plans for the coming of the God-bearing Saint Raphael in our times in which the journey of human beings has become so difficult. His holy figure appeared in order to direct those who have strayed in the darkness to bright roads, to give his hand to those whose knees have bent, to save the shipwrecked who are drowning in the seas, to revive hopes, to reanimate extinguished dreams, to cure endurable illnesses, to show to each one that they possess an eternal soul. But there is no need for one to describe His miraculous power, because the voices of those who have been benefited by his mighty and affectionate hand are infinite. Countless are those who confess that he converted their sorrow to joy. He has healed innumerable individuals, that which science was unable to assist; to so many, time and again, his presence engendered holy thoughts and divine reflections. To our generation the coming of the Saint reveals the fathomless depth of Divine love. The walk of life becomes easier when one does not deny his protection; the pain and the suffering retreats, and the mortal being is directing his steps to his true destiny. How many thrills the hearts feel at the hearing of his name! The wayfarers of life stand with amazement and admiration before his eminence, his miracles, his supreme grandeur. The radiance of the all-alive Saint Raphael bathes and illuminates the faithful, it fills them with awe and dazzle, and with his heavenly message renews strengths and shows the revelation of the Divine will. Who can doubt, after all these pieces of evidence, the immortality of the soul, and who can have any hesitations? The voices are many, there are endless swarms of those, who have experienced the mercy of the living Saint of Love, and they are not in one place, they are everywhere. In the dizziness of our civilization, and the various philosophical currents, an intense spiritual thirst is appearing in contemporary man. The crisis of our times has brought a lot of confusion, and in the heart of the human being there exists so much anxiety. But the infinite love of God has sent us the illuminated Saint, to lead the course of mortals to a good end. "For as many as are led by the Spirit of God, they are the sons of God" (Rom. 8:14). The Heavens are always inviting us to go nearer; God sends at different times His Saints to open up the road. Suffice for us to accept the invitation of His love. No other power can influence, can attract man so much as LOVE. The Crucified Love of Saint Raphael has defeated even death. He loved the Redeemer of the world and he was bathed in His Light, with which today he is enlightening the universe with his presence, and he became the consolation of all, he became the supporter of humanity under trial. Five hundred years have passed since he suffered martyrdom. But no matter how many centuries may pass, he will be amongst people of all nations, the wise interpreter of the Divine will, which, as expressed in our Lord Jesus Christ, is the living image of God, and he will be alleviating pain and suffering, and with His invincible strength he will be guiding souls to the Eternal Light. It is as if I were in the era in which the Saints were living their monastic life, at this place. All alive the Saints appear at midday, sometimes at the Church, sometimes at the wall of the courtyard, and at times at my cell. And particularly when they wish to give comfort to the tortured, the fatigued, to the ill in soul and body people, they are present.